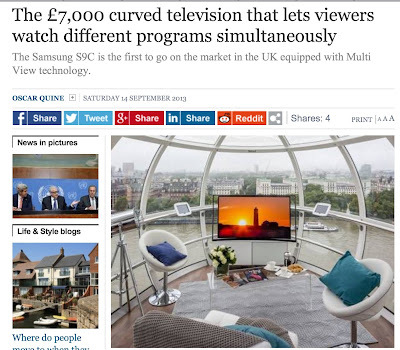 I caught an article in the Independent today saying Samsung is making a curved organic light emitting diode television* (OLED) that will allow two separate content streams to be displayed simultaneously. Viewers sitting side by side can see and hear entirely different shows. Of course they'll have to wearing special glasses with attached ear buds (optional purchase, $200 for a pair). beat them to the answers on QI? This baffles me. If you don't want to watch the same thing on TV as the owner of said TV, move out! What is this fixation with living with other people?! Second of all, where is there a head of household so accommodating that they will sit and watch TV wearing special glasses and headphones instead of using their complete surround system? Just so the other person in the room can be involved in something else entirely, yet they are right there? I guess these are the same people who go to a cafe with a companion and poke at their phone the whole time. I don't understand. What's the point of being in the company of somebody who doesn't share your interests? Frankly I think the better invention would be an app to automate my preferred TV experience. I watch shows with other people all the time. But they're at their house and I'm at my house. We type messages back and forth on Google Hangouts while watching mp4 files of the TV shows. The hardest part is synchronizing the playback so I'm not cracking jokes about a line of dialog they haven't heard yet. If I was actually there on their sofa speaking out loud in my unpleasant voice it would be annoying. But I don't worry about it when it's just text popping up. They can ignore text. So I don't feel bad about blurting out whatever amuses me and I enjoy myself without being reprimanded to shut up. Ever since MST3000 and Rifftrax and live Tweeting it's as much fun to watch horrible TV shows and mock them with your friends as to watch the good ones by yourself. The second hardest thing after synchronizing playback is achieving a pleasing proportion of text to TV picture. I have a 27" Sony TV for my monitor at the foot of my bed. It's hooked to a Mac Mini. I line up the Messages window next to the VLC window and then zoom the whole screen until I see just that part and the text is big enough for me to read from 6 feet away. (I use a big trackball with a scroll wheel that controls my picture really well.) I could have Hangouts on my iPad and just watch the TV show full screen, but I like focusing on both at the same time. That's the way to do it. Share the experience, not the personal space. The other way around? That's just weird. Apple TV and Google, you are free to contact me to consult on your inevitable development of this implementation of existing technology. *Aside from this one weird feature this is probably a stand-up piece of technology. (see additional technical info) I'm just joking. I still support new technology, the sillier the better. That's how we eventually end up with stuff I want. I'm kind of surprised I didn't pay more attention to this in January when it was announced at the Consumer Electronics Show. This makes perfect sense for two-player games. For TV, not really.